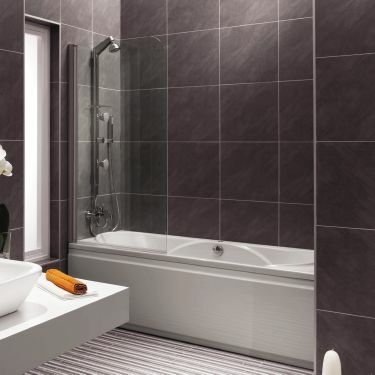 Combining practicality with panache, tiles are an ideal choice for the area surrounding your bathtub. They’re easy to clean and are hygienic, and they come in a wide range of colors and designs to make any décor look a little more luxurious. When shower fixtures are integrated in a bathtub surround, the area must be treated with the same moisture management measures as in any other tiled shower. Wall cavities must be protected from water and vapor penetration, and the waterproofing on the walls must be effectively sealed to the flange of the bathtub to avoid potential leaks and mold growth. Waterproofing for tiled showers with a bathtub can be done in a couple of ways, both equally effective. KERDI-BOARD is ideal for use instead of gypsum or cement board in cases where the wall studs are accessible, while the KERDI waterproofing membrane is perfect for application over wall boards already in place. 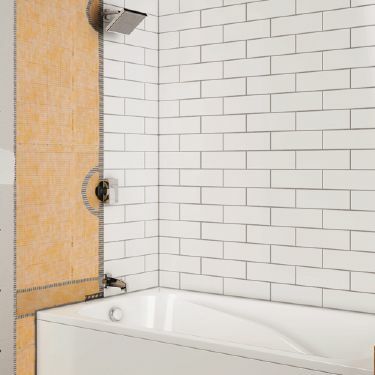 If you have a combined shower with a bathtub, you can waterproof your walls with KERDI, a waterproofing membrane that is adhered to solid backing such as drywall. 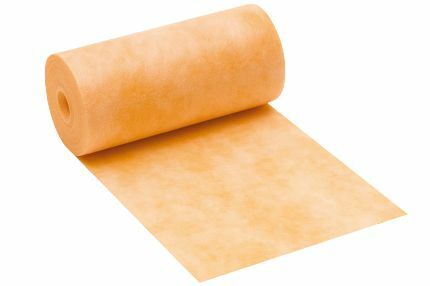 KERDI is a pliable, sheet-applied, bonded waterproof membrane and vapor retarder. It is made of soft polyethylene, which is covered on both sides with a special fleece webbing to anchor the membrane in the thin-set mortar, and features gridlines for perfect cuts every time. KERDI was developed as a waterproofing membrane to be used in conjunction with ceramic and stone tile coverings. Tiles can be installed directly on KERDI using the thin-bed method. KERDI is 8-mil thick and provides moisture management against water and vapor, which can cause mold and mildew in the bathroom. The KERDI-BAND waterproofing strip completes this application, and is applied to all KERDI membrane seams, and is used to make the connection between the KERDI on the walls and the bathtub flange. It’s important to seal any protrusions created by your shower head, mixing valve, or bathtub spout. In this bathtub surround, we use the prefabricated seals, KERDI-SEAL-PS and –MV, which are made with the KERDI waterproofing membrane and feature overmolded rubber gaskets. KERDI-BOARD completely replaces gypsum or cement backer board, and is a quick and efficient way of achieving proper moisture management. 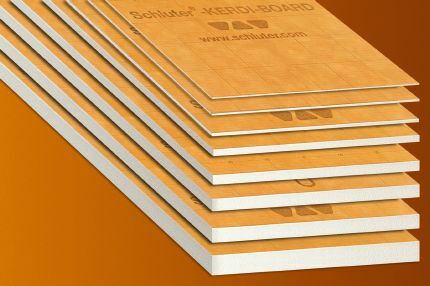 Unlike cement backer boards that are moisture-resistant, KERDI-BOARD is waterproof and vapor-retardant when sealed with KERDI-BAND, and is extremely lightweight and easy to cut with a utility knife. This building panel is also dimensionally stable, and always flat, level, plumb, and square to ensure the perfect substrate for tile. 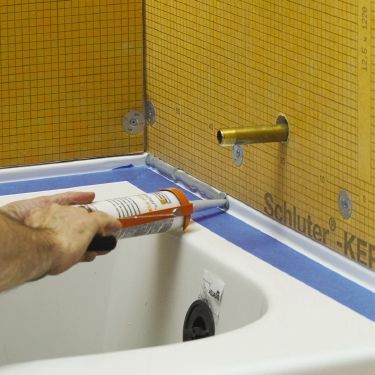 The KERDI-BAND waterproofing strip is used to seal all KERDI-BOARD seams, fastener penetrations, as well as make the connection between the KERDI-BOARD panels and the bathtub flange. 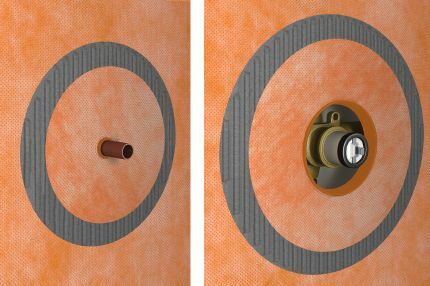 It’s important to seal any protrusions created by your shower head, mixing valve, or bathtub spout. 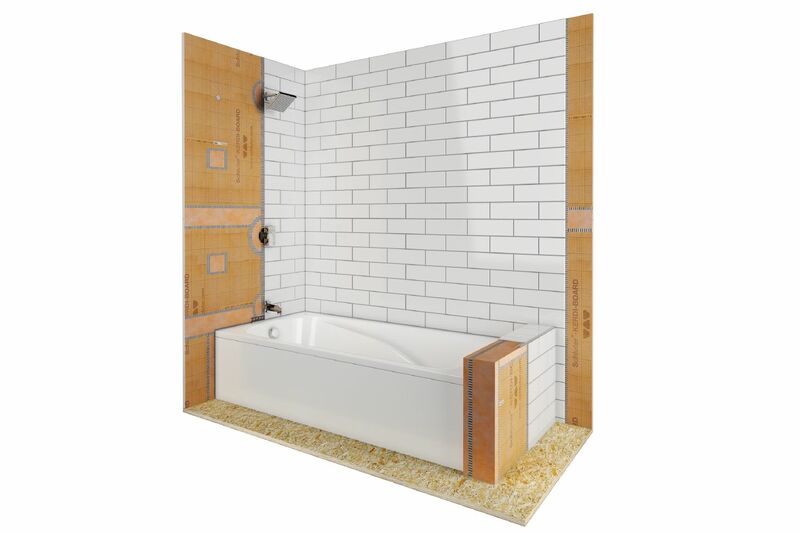 In this KERDI-BOARD shower with bathtub, we use the prefabricated seals, KERDI-SEAL-PS and –MV, which are made with the KERDI waterproofing membrane and feature overmolded rubber gaskets. Here’s one convenient kit complete with everything you need to build ready-to-tile, waterproof walls around bathtubs and acrylic shower bases. Looking for all the components required to create a waterproof bathtub surround? We have everything you need, now in one convenient kit! Caulking around the bathtub is unsightly and difficult to clean. 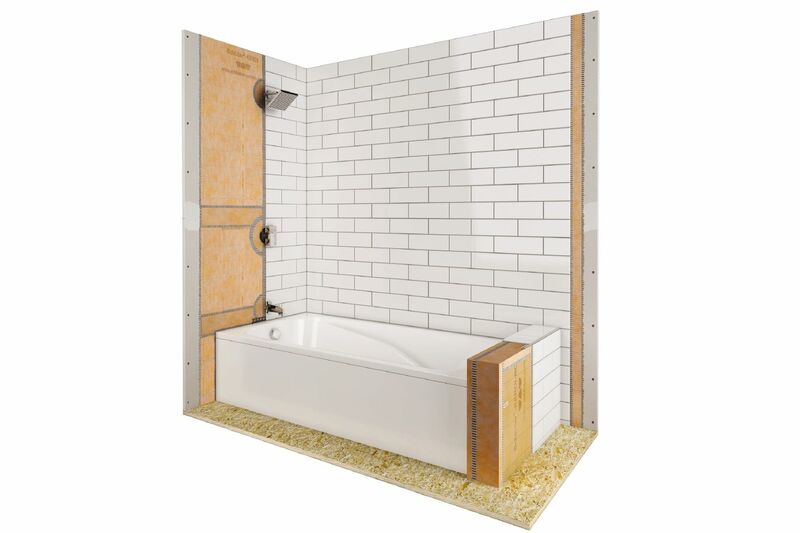 The DILEX-BWA perimeter joint profile is used here instead of caulking to isolate the tile covering on the wall from the bathtub, and create a discreet visible surface. 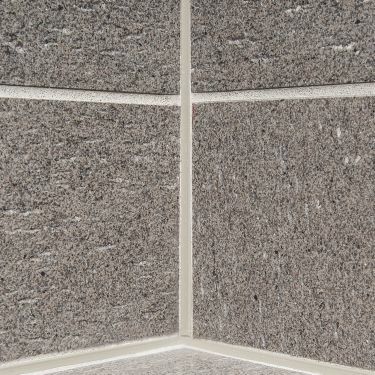 This profile is available in various colors to match your tile and grout. Inside corners are subject to movement which can cause cracked grout, so caulking is often used in these areas. Caulking is not attractive, difficult to clean, and must be replaced over time. 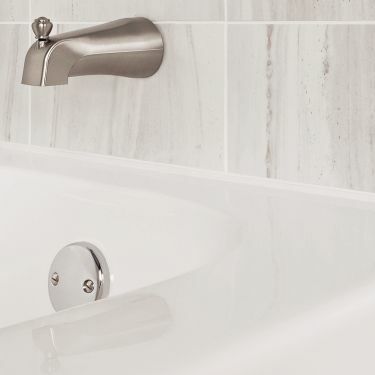 The DILEX-EKE inside corner movement profile is the ideal solution: it mimics a grout joint while creating a straight, discreet movement zone without the need for caulking. On the outer edge of the bathtub platform, we used the RONDEC profile, a symmetrically rounded profile for finishing and protecting the outside edges of the tiled surface. RONDEC can also be used to trim the exposed edges of the tiles of the bathtub surround. KERDI-FIX is a single component sealing and bonding compound with a silane-modified polymer base. It is ideal for bonding the KERDI waterproofing membrane and KERDI-BAND to the bathtub flange to create a watertight seal. 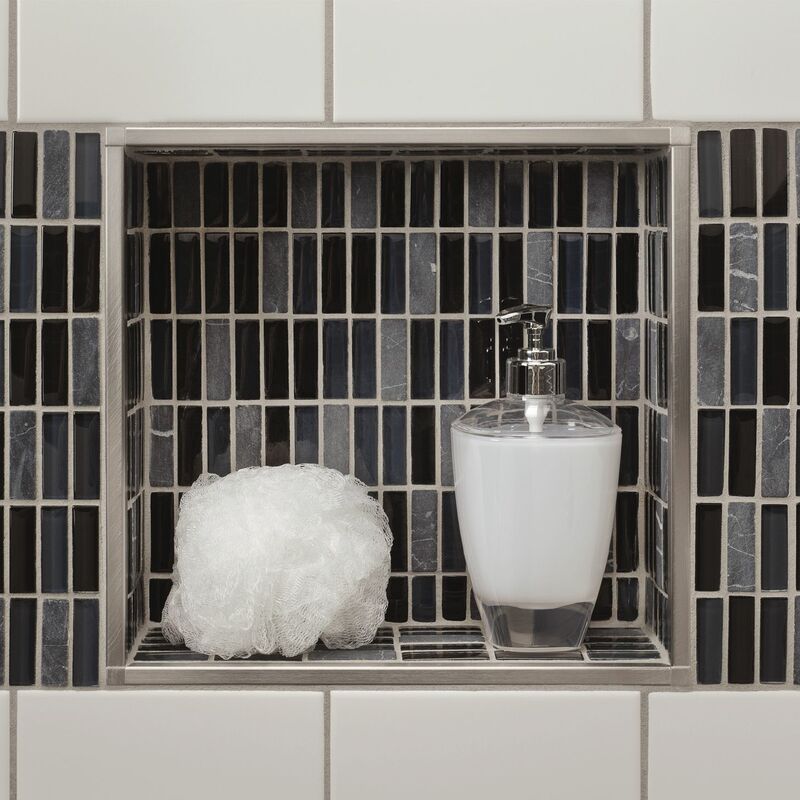 A shower niche is a great addition to any bathtub surround, and a handy place to store your shower essentials. KERDI-BOARD-SN prefabricated niches are made of KERDI-BOARD and can easily be incorporated into both KERDI and KERDI-BOARD wall assemblies.